Novel nanoparticle enables MRI to visualize pancreas inflammation in T1 diabetes for the first time. A pilot study led by researchers at the Joslin Diabetes Center and the Massachusetts General Hospital have revealed that it is possible to use magnetic resonance imaging (MRI) to image the inflammation in the pancreas that leads to type 1 diabetes. This discovery could be a boon for research on methods to slow or halt the disease at an early stage, and could also guide insights into how diabetes progresses. This clinical study, published in the Proceedings of the National Academy of Sciences, tested the possibility of imaging inflammation in the pancreas of human volunteers using ferumoxytol, a coated iron nanoparticle approved by the FDA as an iron replacement therapy, and MRI. Ferumoxytol leaks out of blood vessels in areas of inflammation and is taken up by immune cells called macrophages, which congregate at sites of inflammation. Autoimmunity and inflammation directed against the pancreas and its insulin-producing beta cells underlie the development of type 1 diabetes. However, while tests for autoantibodies (antibodies against the pancreas) can reveal whether a patient’s immune system has at some point attacked the pancreas, these antibodies are not always a good marker for predicting whether a given individual will develop full-blown diabetes. The team explain that many people have genetic variants that put them at risk for type 1 diabetes. Some develop autoimmunity, with only a small number developing the clinical disease. In addition, the development of therapies that could potentially halt patients’ progression from pancreatic inflammation to diabetes has been hampered by the long lead times needed in order to tell whether a given therapy has an effect. For the current study the team recruited 11 patients with newly diagnosed type 1 diabetes and evidence of antibodies against the pancreas, a sign that their beta cells were under inflammatory attack. They also recruited 10 controls with no sign or family history of diabetes. 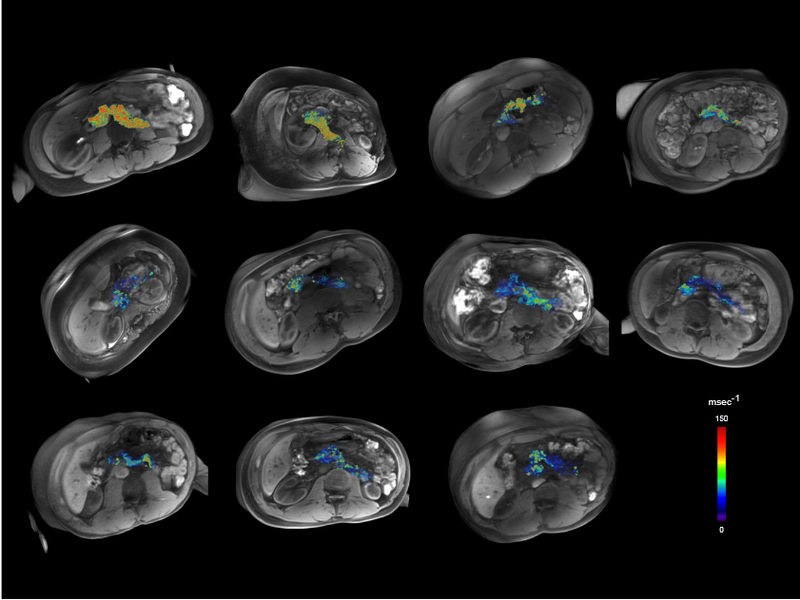 To visualize inflammation across the whole pancreas, the researchers adapted MRI mapping algorithms originally developed for whole brain scanning. All other components of the experiment, including MRI equipment and ferumoxytol, are widely available. The researchers noted that the ferumoxytol dose used in this imaging study is approximately one quarter of the dose used therapeutically for iron replacement. They also state that these are all off-the-shelf components, adding that other centers can do this right now. The researchers believe this imaging technique could have a range of applications in diabetes research and help build a better understanding of the natural history of type 1 diabetes. Already the ferumoxytol-MRI images reveled that in their patient group, inflammation was not uniform across the entire pancreas. There was also a large amount of variation between individuals, which aligns with what the medical community see clinically. That’s never been shown in living humans before. The team summise that only about five percent of the first degree family members of a person with diabetes will develop occult disease. It might make sense to scan people in that group to see who is likely to progress and who isn’t. Those who are progressing may be the ones to recruit for research on immunomodulatory therapies. 3D reconstructions of pancreata of 11 patients with T1D. A pseudocolor = ΔR2* map was fused onto a volume-rendered 3D-T1 VIBE MRI image dataset. Shown are the 11 patients with recent-onset T1D. Noninvasive mapping of pancreatic inflammation in recent-onset type-1 diabetes patients. Gaglia et al 2015. What is the fate of the Iron oxide nanoparticles entrapped in the pancreas after the imaging test, since they are non biodegradable?